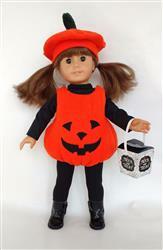 Create a fun "one size fits all" pumpkin costume for your 15 and 18 inch dolls! This PDF pattern includes directions for a body suit and hat for all dolls plus a long sleeve top pattern for Bitty Baby/twins. 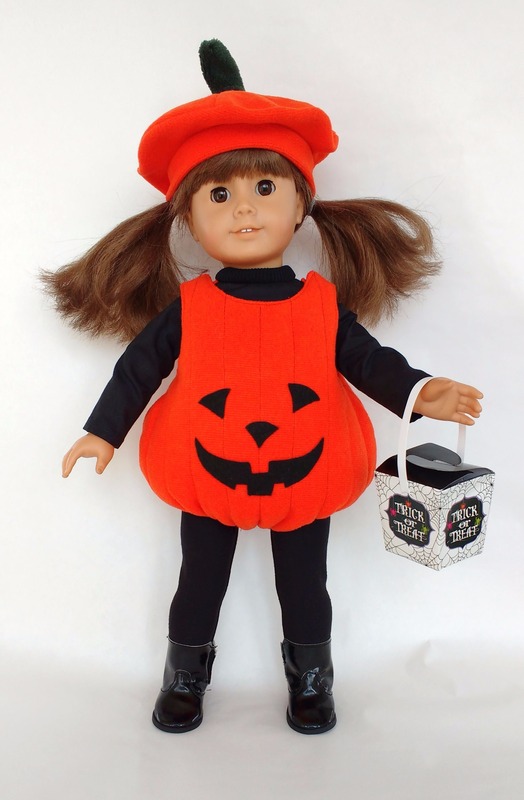 Made it in orange fleece for an 18” AG doll, using my Maplelea doll as a model. I followed the pattern exactly and it turned out very well. Also the hat fits over all that hair! So cute. Used the Liberty Jane leggings pattern with the tights modification, and the Liberty Jane Baseball T-shirt pattern, both in black jersey, and both very easy to sew. Now they join the Jelly Bean Halloween Party Outfit, which also turned out very well, and fly from Vancouver Island to Montreal. Two happy granddaughters. Great pattern!outfit turned out ADORABLE! !